This is one of the most talkative cats around. If your Colorpoint Shorthair has something on her mind, you're going to hear about it! Smart, playful, and OK, a little needy, this kitty is a great choice for folks who want a feline who's going to be up in their business. Colorpoint Shorthairs are basically ginger Siamese. Breeders crossed Abyssinians, Siamese, and a domestic red shorthair to create this technicolor kitty. Colorpoint Shorthairs now come in many various point colors. This breed can grow to between 5-9 pounds and lives an average of 12-15 years. WHAT IS THE COLORPOINT SHORTHAIR'S PERSONALITY LIKE? Colorpoint Shorthairs are extroverted empaths: they're solicitous of your attention and affection, and very sensitive to your moods. (If you need someone who'll cuddle you during a sad movie marathon on Netflix, the Colorpoint Shorthair is there for you.) This fun-loving, outgoing breed bonds closely to one or a very few chosen people. She'll do fairly well with children and dogs. WHAT IS COLORPOINT SHORTHAIR BEHAVIOR LIKE? Energetic and attention-seeking like their Siamese cousins, Colorpoint Shorthairs are some seriously chatty kitties. These athletic felines like high places and are constantly on the move. This busy, busy, busy breed is happy to fetch and will keep you on your toes. HOW CAN I KEEP MY COLORPOINT SHORTHAIR ENTERTAINED? Colorpoint Shorthairs respond well to basic commands and love to learn tricks. They also enjoy outsmarting puzzle toys for treat rewards. WHAT DO COLORPOINT SHORTHAIRS LOOK LIKE AND WHAT ARE THEIR GROOMING NEEDS? Colorpoint Shorthairs have silky white coats with colored points (as you might have guessed from the name). They come in almost two dozen color variations! 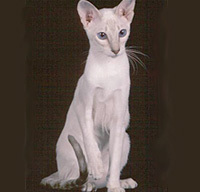 But all Colorpoint Shorthairs share the same beautiful blue eyes of their Siamese cousins. Their tails taper and their legs are slim, giving this breed an elegant look. Their dense, short coats tend not to shed very much and these cats are fastidious groomers. Plan to comb or chamois or Colorpoint Shorthair weekly. She probably won't need regular bathing. WHAT HEALTH PROBLEMS DO COLORPOINT SHORTHAIRS HAVE? Colorpoint Shorthairs are generally healthy. Some are susceptible to lung and heart disease or sternum malformations. Some develop protein disorders that lead to liver dysfunction. ARE COLORPOINT SHORTHAIRS GOOD FOR PEOPLE WITH ALLERGIES? Colorpoint Shorthairs aren't among the breeds generally recommended for allergy sufferers. They do produce less dander than many other breeds, however, so folks with mild allergies might find them a good match. WHAT IS MY COLORPOINT SHORTHAIR'S BEST DAY? Whatever else you do together, the Colorpoint Shorthair is going to talk your ear off. You know they like high places, so why not think vertically? Put a cat tree over by the window, clear off some high shelves so she won't knock things over, and give this busy kitty some room to explore. SHOULD I ADOPT A COLORPOINT SHORTHAIR? The same considerations that go for a Siamese go for a Colorpoint Shorthair: this is a very active, very vocal cat who wants all your attention all of the time. If you're looking for a chatty feline shadow, think about convincing a Colorpoint Shorthair to adopt you. Have you decided that a Colorpoint Shorthair is the purr-fect cat for you? Why not be your new best friend's hero and adopt a rescue! Be sure to check out our article on what to expect when you're adopting a dog or cat.